After transferring, Garrett got involved on campus right away. As a psychology student, Garrett has enjoyed getting to know the three professors in the department as “each has a very unique specialty within their field, and just personality in general, I have really enjoyed trying my best to enjoy their contribution to me as a student and to the program of psychology as a whole. 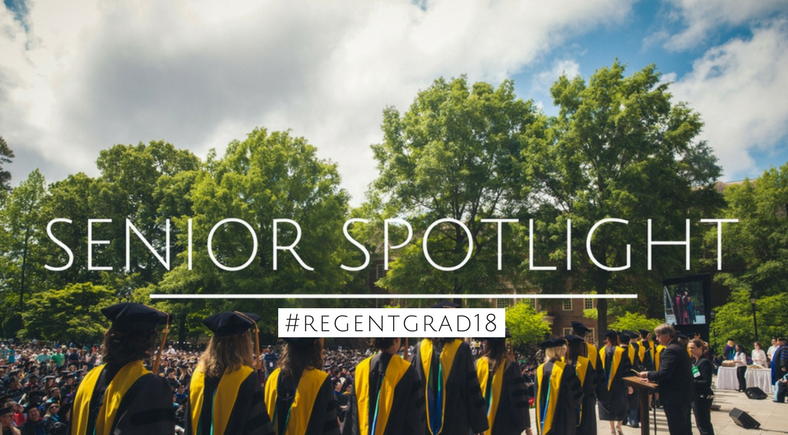 Meeting them in office hours and just treating them like people rather than like professors – I really enjoyed that experience of seeing that side of Regent and college in general.” Garrett has a heart for helping people address and work through their brokenness and hopes to pursue counseling in the future. After finishing at Regent over the summer, he hopes to have a counseling internship before going on to pursue a master’s in psychology. Thanks for tuning in to this last senior special. That is all we have for 2018. Congratulations to all of the graduates!